I bought my first pair of Spanx, the miracle undergarment for gracefully aging women, almost 10 years ago. At the time, I was completing the purchase of an exorbitantly priced party dress to wear to a friend’s posh wedding in the Bahamas. It could be argued that I didn’t quite need Spanx yet, but I was at risk of ending up in some magazine or tabloid photo, so I bought them. And I loved them. Since then I’ve expanded my Spanx wardrobe to include a variety of items, all fulfilling the promise of smoothing things out, no matter what I squeeze myself into. The problem is that the promise of sleek and smooth will never win out over the simple law of displacement of mass. What gets squeezed in one place gets squeezed out in another. And at some point, aging gracefully means that you understand there’s only so much you can do to fight time and gravity. So it’s with that in mind that I now find myself somehow hopelessly beyond Spanx. I came up with these drawings to illustrate a friend’s wonderful blog post last year, shortly before realizing that I’d be better off just buying stock in REI and dressing myself in ambulatory tents. 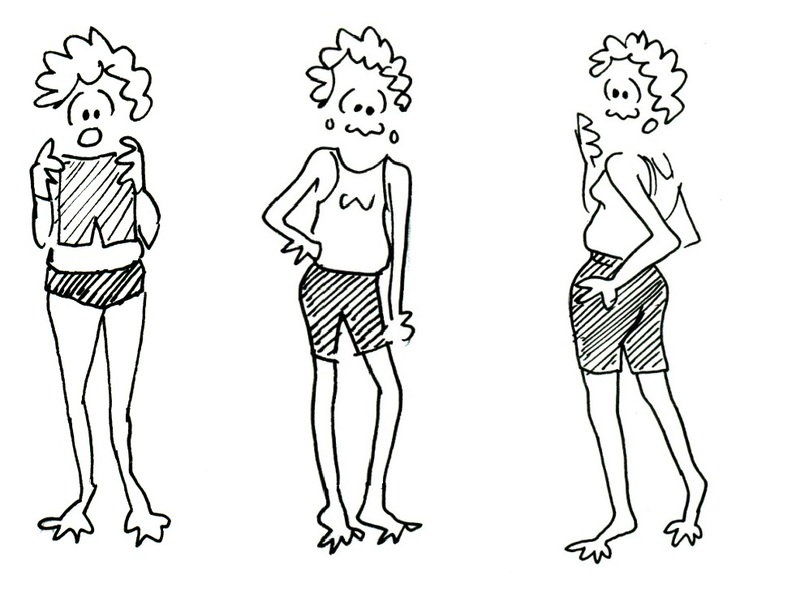 Given my familiarity with the Spanx product line, I couldn’t help but use myself as the model, and I’ve been cracking up at these drawings ever since.